It started in grade 2 and ten years later in grade 12. In grade 2, I remember I had an assignment to do based on a children’s book…I think the book was from the Big Red series by Jim Kjelgaard. I remember writing something pretty rudimentary about the story but the part of the project that got me completely jazzed was when I illustrated my writing with drawings I made in coloured pencil crayon. 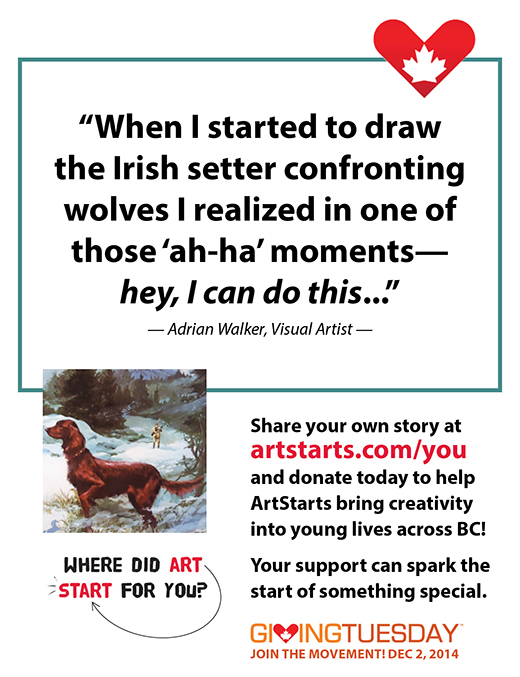 When I started to draw the Irish setter confronting wolves I realized in one of those ‘ah-ha’ moments, hey I can do this. My drawings were, I thought, pretty good. My parents encouraged me throughout the assignment. In the end I remember my teacher telling me I had done an amazing job. She must have, because I think she kept them. At least, I have no memory of having them returned to me. In grade 12 I took an art history course called Western Civilization. This, in a nutshell, was the deciding moment when I knew I wanted to spend my life immersed in Art. I was already making art but now I had discovered a whole new level of interest that was essentially just the tip of the iceberg. Western Civ. provided the stepping-stones that led me directly into a world of literature, philosophy and critical thinking that would become the framework for my art practice to this day.